The Palazzo of Sangro di Casacalenda is the building that closes the southern side of the square of San Domenico Maggiore in the historic center of Naples (#16 on this map). It was commissioned by Lucio di Sangro, the duke of Casacalenda and was built in the second half of the 1700s; the construction was started by Mario Gioffredo and finished by Luigi Vanvitelli. There are still frescoes within the Palazzo Casacalenda by Fedele Fischetti (1734-1789), a Neapolitan painter now regarded as somewhat of a minor artist, but whose works nevertheless adorn a number of sites in the area, including the Capodimonte Palace, the Royal Palace, and the Palace of Caserta. As is the case with many other large buildings in the historic center, it is difficult to stand back and look at this large classical facade and think that the building was at one time the residence of a single family, but it was. 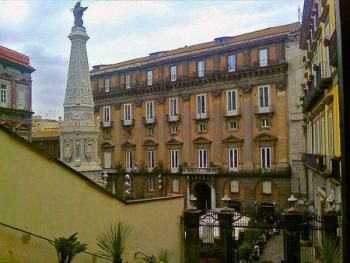 In the immediate area on the square, some of the buildings now house university spaces and some, such as Palazzo Casacalenda, are given over to small shops at street level with the upper stories subdivided into private apartments.